Of all the North American lizards, Horned Lizards are the most fearsome-looking and distinctive by virtue of the pointed, protruding "horns" above their eyes. The Horned Toad, (Phrynosoma douglassi brevirostre,) commonly called "horny toad " by the children who hunt it, was adopted as Wyoming state reptile in February, 1993. The Horned Toad is actually a lizard with a flat, broad body and spiny skin, resembling a toad. Sharp, horny spines stick out of its head and smaller spines stick out on its body. These spines protect the Horned Toad from predators. The Horned toad squirts jets of blood from its eyes when threatened by a predator. Diet for a Horned toad is mainly insects, but it will eat small creatures such as spiders. The Horned Toad is usually the color of its surroundings. It enjoys sunning itself on warm rocks when it is not scurrying around under the brush. The numerous species of Horned Lizards, all members of the genus Phrynosoma, have very wide, flattened, toad-like bodies. The tail is short but broad at the base. In most species, the back of the head and temples are crowned with a prominent row of sharp, pointed horns. The tail and sides are fringed with sharp spines. On some species the sides are adorned with a double fringe of spines. On the back, there are rows of short conical spines. To the uninitiated, their dragon-like appearance is quite formidable. The squat form and head armor has given rise to the name "hornytoad," "horned toad" and "horned lizards." 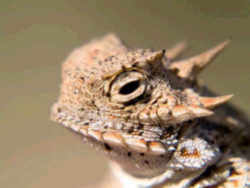 However, since there is a true toad with horns, it is best that we speak of this genus as the "Horned Lizards." Their colors are pleasing. The back and head are soft desert gray. The markings are in pastel shades of tan, brown, red or yellow. The underparts are pale, yellowish gray. The overall colors are generally close to the predominant color of the soil. Color changes from light to dark (or reverse) can occur within a few minutes. Horned Lizards are found only in the western portions of the United States and Mexico. 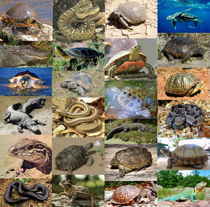 There are 14 recognized species. 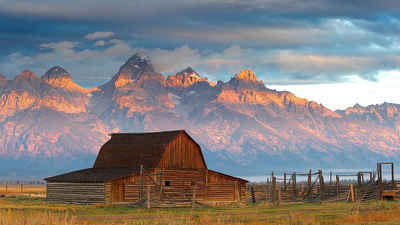 They range from Arkansas to the Pacific Coast, and from British Columbia south to Guatemala. These lizards are creatures of hot, dry, sandy environments. Some of the species inhabit the deserts proper where the sun, beating on the arid landscape, produces ground heat that is almost unbearable to humans. Others enter mountainous areas and are found as high as 10,000 feet. The most common Horned Lizard in the western deserts is aptly named the Desert Horned Lizard (Phrynosoma platyrhinos) consisting of two subspecies: the Northern (P.p. 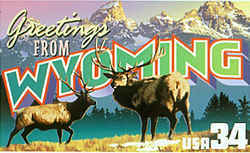 platyrhinos)which inhabits the Great Basin Desert; the Southern (P.p. calidiarum) which inhabits the Sonoran and Mojave Deserts including a finger of the east coast of northern Baja California. Regardless of where they occur, there is a similarity in their habits. In the fall, they hibernate by burying themselves in the sand. They emerge in the spring when the sun's rays have reached a certain temperature. The first few hours of the day are spent basking, usually flattened against a rock or on slanting soil, so their back is exposed to the sun. At times, while warming up, they may flatten and tilt their bodies toward the sun to obtain maximum radiation. As soon as their body temperature rises to a specific degree, they commence foraging for food. As the heat of the day increases, they become more active. They feed on slow-moving, ground-dwelling insects, spiders, sow bugs, an occasional tick and even items as large as the butterfly and sphynx moth larvae. But ants seem to be their major food source. They do not pursue their victim hastily, like some lizards, but poise over it and methodically take it, in toad-like fashion, with a flick of their long, sticky tongue. The toad-like action ceases if disturbed, for they will flee as rapidly as a startled mouse. After feeding, when ground temperature becomes too hot, they seek the shade of a shrub, partially concealing themselves. There they spend the remainder of the day. In the evening, while it is still warm, they "dig in" for the night. This is a curious process. They stick their nose in the sand like the blade of a plow and wriggle forward to create a short furrow. After flattening the body, they use the spiny border of the sides in a shovel-like fashion to scoop and dig their way into the sand. Sometimes they bury themselves 3 or 4 inches deep, and other times they just leave the top of the head and eyes exposed. Their coloration is such that they blend readily into their surroundings, making them difficult to find. However, when found partially covered with sand, they are rather easily captured. Their defense mechanism is quite limited. When caught by hand, they may distend their bodies by filling their lungs with air and twist their head in a futile attempt to scratch you with their horns. On occasion they spurt blood from the corners of their eyes, which is startling, to say the least. Mating occurs in late April, peaks in June and stops abruptly in July. Egg laying starts a few weeks later, usually in late July and early August. The farther north, the later the eggs are laid. In some species the eggs are retained, and the young are hatched just before, during or shortly after laying. Others bury the eggs in the sand where they require several weeks for further development before the eggs hatch. The egg shells are white and flexible and average about one-half inch in diameter. The number of eggs varies with the species. Some have from 10 to 30 eggs with an average of about 15. The young are called hatchlings. They average 7/8 to 1-1/8 inches long, snout to vent. The young have been observed to bury themselves in the sand immediately upon hatching. The babies receive no parental care, so when they emerge, they start to hunt for food. The young are cute, the horns on their head are apparent, although the rest of their skin, while well marked, is relatively smooth. They grow most rapidly in late summer and early spring when there is an abundance of food. There is no evidence that they reproduce the first year, but they are classed as young adults by the end of the second summer and probably reach full growth in three years. Some species reach a snout-to-vent length of 6 inches. Most species are less than 5 inches in length. Because they are so fearsome in appearance, yet quite harmless, desert visitors tend to collect them to show the folks back home. Horned Lizards are neat creatures but hard to keep because most of them are obligate ant eaters and, at that, eat a very limited number of species of ants. Some do diverge from the ant diet at certain times of the year such as the Regal Horned Lizard, which gorges itself on tiny beetles and eschews ants altogether when the beetles are abundant. Also, the Coast Horned Lizard can survive on inverts other than ants. But the Flattail and Shorthorned, as well as the Desert Horned Lizards, are closely tied to ants and will die if those are not supplied in quantity. Habitat destruction and ant destruction have placed several species of Horned Lizards in danger. After all, the first thing people do when they move into the desert is kill the pesky ants, thereby depriving Horned Lizards of their only dependable diet. Taken from their native surroundings and offered an improper diet and an inadequate place to live, Horned Lizards soon die. 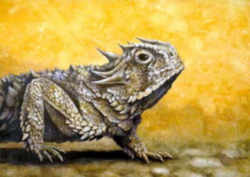 Consequently, the Department of Fish and Game has been given the authority to limit the take and possession of Horned Lizards. It is best to simply examine one carefully, then release it where found, for that is where it rightfully belongs. The law designating the eastern short-horned lizard as the official Wyoming state reptile is found in the Wyoming Statutes, Title 8, Chapter 3, Section 8-3-115. The eastern short-horned lizard (Phrynosoma douglassi brevirostre (Girad)) commonly known as the horned toad, is the state reptile of Wyoming. HISTORY: Laws 1993, ch. 58, § 1. 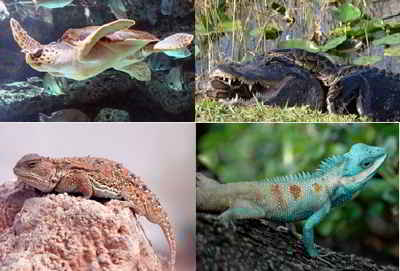 Twenty-six U.S. states have named an official state reptile.